We now have a STEM Backpack, specially created for children aged 3 - 8. Visitors will find, in each one, games and puzzles that will introduce children though play and exploration to the subjects of Science, Technology, Engineering and Maths – as well as the Museum’s many stories and objects. Created by experts from our Access and Learning Team, the STEM backpacks have been developed to help parents and carers talk to their children about scientific principles and ideas in a way that is fun and age-appropriate. 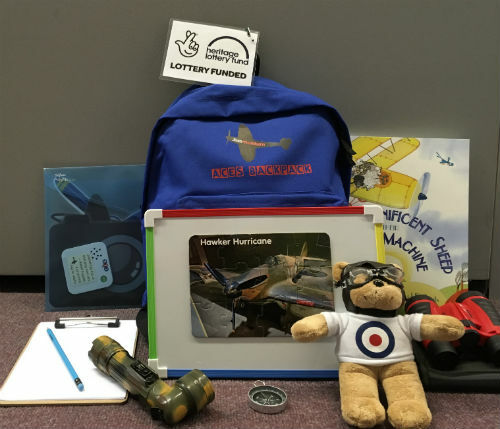 10 backpacks have been created and will be available free of charge from Hangar 3's Reception area for a deposit of £40 or by leaving a driving license or credit card / debit card. This will be returned, when the backpack is returned at the end of your visit. So why not give your little-ones’ scientific journey a flying start and start exploring our amazing collection with our STEM back-packs. This activity is supported by the Heritage Lottery Fund.